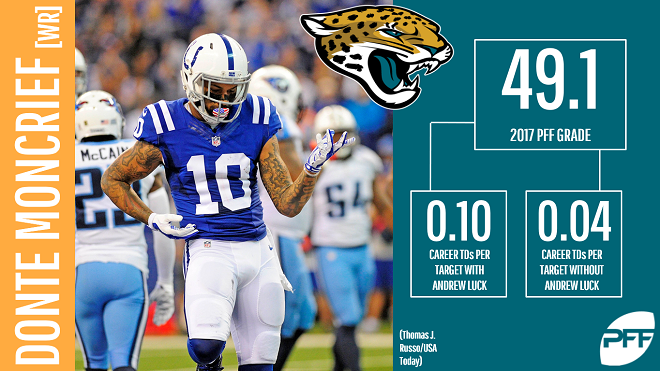 After deciding to move on from Allen Robinson, the Jacksonville Jaguars addressed their wide receiver corps with the addition of free agent Donte Moncrief. Jacksonville also re-signed Marqise Lee and have Allen Hurns, Dede Westbrook, and Keelan Cole on the roster. Moncrief showed promise over his first two seasons in the NFL, and surfaced on the fantasy radar as a borderline WR3 option in 2015 when he posted 733 receiving yards and six scores. But injuries have plagued Moncrief over the last two years, causing him to miss 11 games during that span. To make matters worse, Andrew Luck’s injury issues contributed to a forgettable 2017 campaign for Moncrief where he caught just 26 balls for 391 yards and two scores. While the overall body of work is spotty at best for Moncrief, he’s entering just his age-25 season. He’s also displayed enough upside over his career to keep him in the fantasy conversation. Of course, he joins a very crowded house in Jacksonville where Lee figures to be the top target entering 2018. In order for Moncrief to be viable, he’ll need to beat out Westbrook and Cole for the outside spot opposite Lee. It’s also important to note that the Jags made it no secret that they’re a run-first team. The addition of Andrew Norwell further reinforces their commitment to the run. Not to mention the fact that Blake Bortles has been far from reliable at fostering a productive fantasy environment for his receivers. At this point, it’s tough to consider Moncrief as a fantasy option in 2018 redraft leagues, but his youth at least salvages some fantasy value in deep dynasty leagues where he’s still a hold.